Our favorite finds for every style and space. When it comes to the living room, there are a handful of decorative pieces that stand in as the defining elements: The sofa is undoubtedly one, often times doubling as the focal point of the room, while the coffee table comes in as a close second. As one tends to dictate the decorative direction of the other, when it comes to making a purchase, it’s important to consider the aesthetic established, while being mindful of how the two pieces will complement one another. The beauty of a coffee table lies within the fact that you can be bold enough to embrace a design that skews towards the more avant-garde. Regardless of its composition, and how abstract it may be, it’s difficult to override its element of functionality. With this in mind, we set out to find the latest offerings on the market, which will undoubtedly impart a major dose of style to your living room. Featuring a tempered glass top (i.e. it’s stain-resistant and easy to clean), this set of nesting tables is ideal for the tiny living room. Maximize floor space by clustering the tables together, keeping things neat and compact, and elongate when entertaining or when you’re simply in need of a little more display space. Crafted in the 1970s, this stunning statement piece is comprised of travertine stone and a brass inlay with an original glass top. If you can’t already tell, we’re highly in favor of the sculpturally-detailed pieces. Think about it: there are only a handful of opportunities to imbue such a dynamically-charged element to your living room, and this vintage piece definitely fits the bill. Tinted glass coffee tables will be making it big this year, especially those that are geometrically-skewed. This contemporary version, designed by Tracey Boyd, boasts a tempered glass tabletop, shelves for added storage space, a champagne-stainless steel frame, and pink-tinted glass for an elevated finish. We can’t think of a better way to add a subtle pop of color and a major dose of personality to your living room. In need of a luxe addition to your space? This white marble coffee table is definitely the way to go about it. Set atop natural oak legs, its sleek surface exudes an air of contemporary cool while the subtle brass accents bring about a much-needed lustrous detail. Available in two chic colorways, this clever piece is all about form and function. Featuring an ingeniously concealed storage solution, courtesy of the removable tabletop, the streamlined table exudes an effortlessly chic aesthetic with its minimalist design. We’re chalking this one up as a serious investment piece. 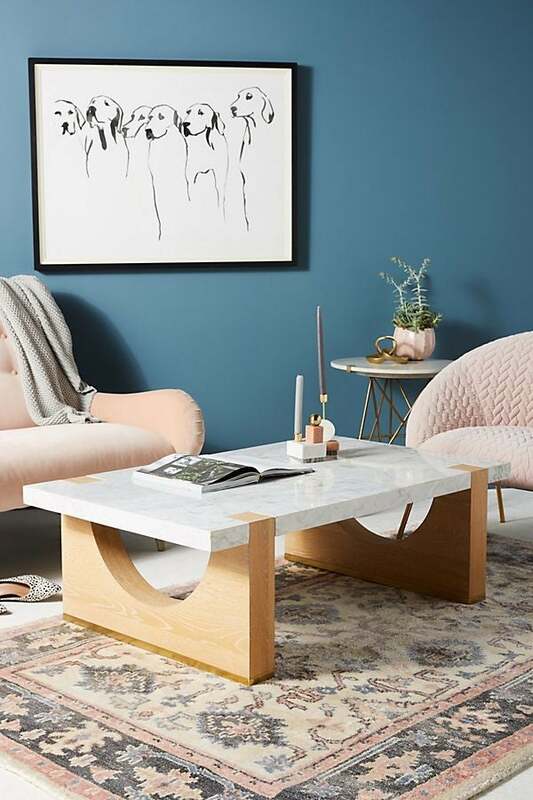 Considering the fact that this ’70s-inspired acrylic table can essentially double as either a coffee table or sculpture, it just may be reason enough to make the splurge, justifying the hefty price tag. Boasting a concave insert, which will allow for a unique storage medium, it can be displayed one of two ways. Talk about a steal! Crafted from natural pine and set atop monochromatic lacquered metal legs, this sleek table was made for the minimalist scheme. Its neutral finish earmarks it as an easy add-on, versatile enough to complement a wide variety of decorative schemes. Crafted from a trio of mixed materials, this sculptural statement piece was made for the modern space. Featuring a glass surface set atop a marble slab, oak triangle, and dark rose gold-finished open corner wedge, this geometric table will seriously up your decor game. For the Scandinavian enthusiasts, look no further than this minimalist essential that’s beautifully understated yet bold enough to make a statement. Featuring an ultra-matte surface, a product of a new laminate technology, it yields a soft-to-the-touch effect and is easy to clean. Small-space dwellers may not have the luxury of indulging in a sizable coffee table, hence why a workaround is in order. Enter this beautifully structural yet minimalist piece that is cleverly streamlined with an acrylic top and a blackened steel geometric base. And, what this compact piece lacks in breadth, it certainly makes up with style. Sourced from a flea market in Lyon, this mid-century modern coffee table is versatile enough to complement a variety of decorative aesthetics. Its beautifully stained wooden composition will invite an element of warmth to the space it occupies, bringing about a rich dynamic with a burst of character. Set atop solid wooden legs, this one is about as minimalist as it gets. From its Scandinavian-inspired finish to the beautifully streamlined composition, it’s the ideal piece to help establish a hint of balance to your space.